The custom proxy example shows how to create a custom proxy to use with Q3DBars. The interesting thing about custom proxy example is the custom dataset and the corresponding proxy usage, so we concentrate on that and skip explaining the basic Q3DBars functionality - for that see Bars Example. This example defines a simple flexible data set VariantDataSet where each data item is a a variant list. Each item can have multiple different values, identified by their index in the list. 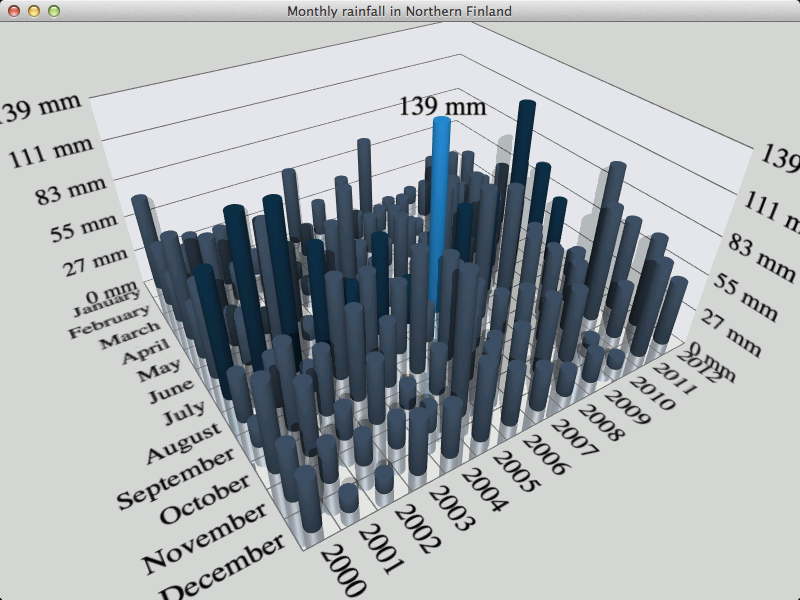 In this example, the data set is storing monthly rainfall data, where the value in index zero is the year, the value in index one is the month, and the value in index two is the amount of rainfall in that month. The custom proxy we provide here is similar to item model based proxies provided by Qt Data Visualization in that it requires a mapping to interpret the data. As you can see, the data items are simply QVariantList objects, and the data can be added either singly or in lists. The only additional functionality provided is clearing the data set and querying for a reference to the data contained in the set. Signals are emitted when data is added or the set is cleared. // Doesn't gain ownership of the dataset, but does connect to it to listen for data changes. // Map key (row, column, value) to value index in data item (VariantItem). // Doesn't gain ownership of mapping, but does connect to it to listen for mapping changes. // Modifying mapping that is set to proxy will trigger dataset re-resolving. In resolveDataSet() method we sort the variant data values into rows and columns based on the mapping. This is very similar to how QItemModelBarDataProxy handles mapping, except we use list indexes instead of item model roles here. Once the values are sorted, we generate QBarDataArray out of them, and call resetArray() method on the parent class. The primary way to use a VariantBarDataMapping object is to give the mappings already at the constructor, though they can be set later individually or all together with the remap() method. A signal is emitted if mapping changes. It is basically a simplified version of the mapping functionality of QItemModelBarDataProxy adapted to work with variant lists instead of item models. // into a variant data item and add the item to the item list.